Today, I’m going to cover a few methods for optimizing and speeding up Google Fonts in WordPress. Images, of course, are and always will be the heaviest part of a web page, but according to HTTP Archive, as of October 2016, web fonts are just over 3% of an average page’s overall weight. 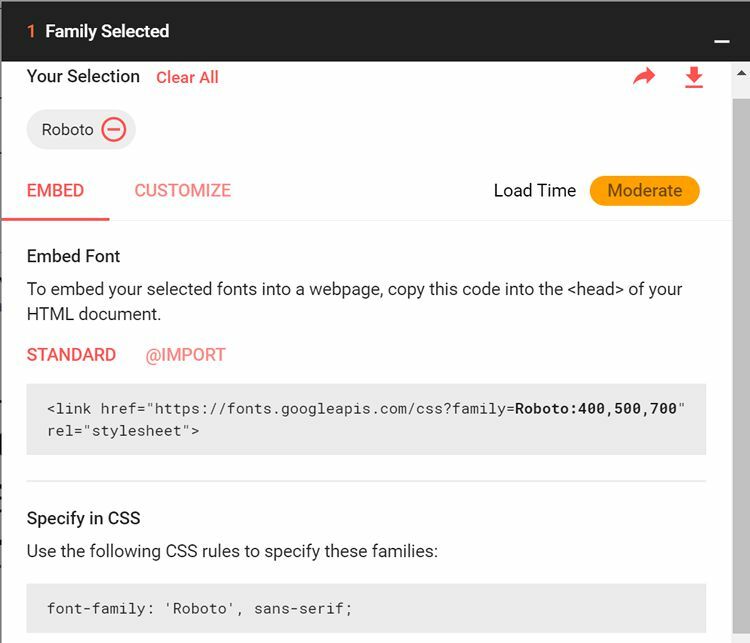 Even though the weight of web fonts makes up only a small portion of the overall web page, every optimization you make helps contribute to faster load times. Check out some ways below to speed up those fonts! First off, for those of you who might not know, Google Fonts is an open source (free) directory of over 800 web font families which you can use on your website. They are also available to download locally for print and other uses. Millions of WordPress websites utilize Google Fonts as it is a great free way to enhance the look and usability of your site. If you are going for pure performance, system fonts will always win, but there is nothing like the professionalism and aesthetic of a good web font. And in fact, typography has been shown to affect conversions in a positive way. But everything has its cost. And so it is important to understand how adding Google Fonts to your WordPress site affects speed and performance. There are a couple of ways to add Google Fonts to your WordPress site. The first and default way is to grab them directly from Google. This method uses their global CDN to deliver the fonts quickly from different servers from around the globe. When you add them to your site there will be an external request to fonts.googleapis.com. The are also external requests to fonts.gstatic.com for the WOFF or WOFF2 versions depending upon browser support. If you are WordPress beginner, the easiest way to add Google Fonts to your website is probably with a free plugin. The Easy Google Fonts plugin is a good popular example. As of writing, it currently has over 300,000 active installs with a 4.9 out of 5-star rating. 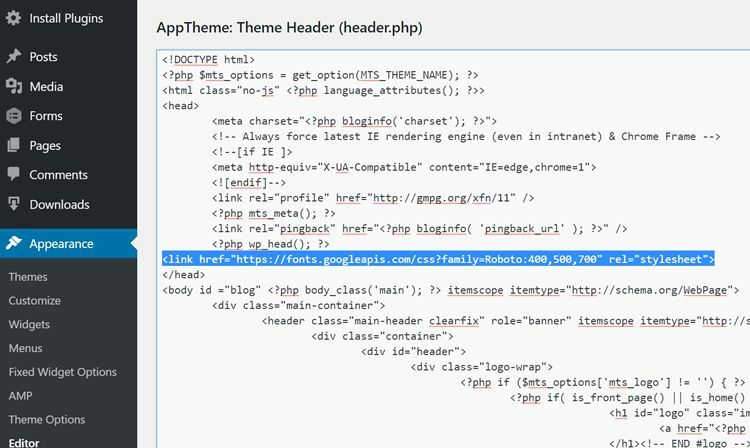 It is important to note that most WordPress plugins add slight overhead and so I prefer to add Google Fonts with their much simpler to use embed code. 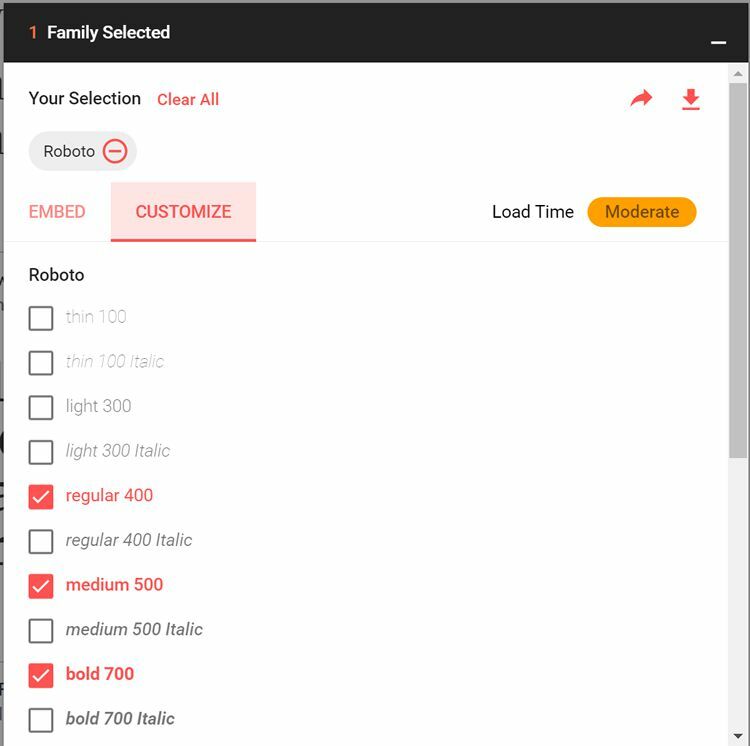 So, head over to Google Fonts and choose the font you want, for this example I’m using Roboto. Click on the “Customize” option. This is an important step as each font family has different font weights. Typically you will want regular, medium, and bold. Note: Every font weight you include adds to the overall load time of your fonts, so don’t just select all of them. The less, the better. Then click on the “Embed” option. This is where you will want to copy the embed code it provides. Take that code and put it into the <head> section of your WordPress site. There are different ways you can do this, some might prefer to enqueue the fonts, but for this example I simply added the code to the header.php file. Note: This might vary slightly depending on the theme you are using. Then to actually make your WordPress theme use the Google Fonts you have to add some CSS styles. Below is an example of what I’m using. If your theme admin panel doesn’t have a custom CSS editor you can always use a free plugin like Custom CSS and JS. Now that you know some quick methods for adding Google Fonts to your WordPress site, I’m now going to do a few quick tests to see alternative ways of speeding them up. I ran some tests first with the setup above and the average speed came out at 418ms. Note: Each test was run five times, and the average result was taken. Another way to deliver Google Fonts on your WordPress site is to host them locally on your web server. If your audience is in a certain geographical location and close to your server, it can actually be faster to host them locally than it is to use Google Fonts. Google Fonts CDN is great, but adding those additional external requests and DNS lookups can cause delays. This method will typically only work if you are using fast hosting. In the example, I’m using managed WordPress hosting from Kinsta, who is ironically powered by the Google Cloud Platform. We then need to make sure to remove the embed code from Google Fonts in the header so that you no longer have those external calls. I then again ran some tests with the setup above and the average speed came out to 386ms. Note: The web server is located in Iowa, and the speed test from Pingdom was run from Dallas, TX. So as you can see, even though the server is located elsewhere in the United States, it is still slightly faster to load Google Fonts locally on the server. Of course, you will want to test various locations yourself based on your own audience. I’m using the free CDN Enabler WordPress plugin. This actually copies the fonts from the “fonts” folder on the web server to KeyCDN automatically. We then have to tweak the code slightly so that the path to the fonts is now pointing to the CDN (such as cdn.domain.com). I then again ran some tests with the setup above and the average speed came out to 384ms. As you can see, using a CDN is yet again just slightly faster. Not by much, but if you compare it to Google’s CDN test it definitely is faster. Part of this is because it can utilize the same HTTP/2 connection and it still reduces the external call and DNS lookup, just as hosting locally does. And of course, one advantage to this method is that it will be globally faster. As you can see from the tests above, the Google Fonts CDN is great, but it might not always be the fastest. Of course, it will always depend on your own environment and where you are serving up traffic, whether it be to a local audience or global. I recommend testing each method above for yourself and see which one is the fastest and works the best for your WordPress site. And remember, only load the font weights you actually need!